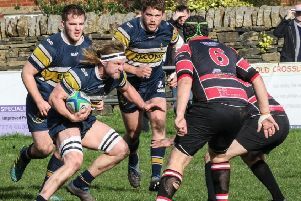 This season’s final battle for local bragging rights in Yorkshire One takes place at Woodhead on Saturday when Old Brodleians host Old Rishworthians (3.0). There is an added incentive for the victors with second place in Calderdale’s six-strong pecking order up for grabs. Heath are sure to finish top dogs and there is currently only one point between Brods in seventh and Rishworthians in eighth, in their debut season in the division. The gap is so narrow because Brods have been docked five league points following their refusal to travel to Beverley several weeks ago due to the poor travelling conditions. Brods’ appeal against the decision has been declined by the RFU. A large crowd is expected and will be swelled by the numbers from a sold out pre-match lunch. The sides met in the opening game of the season at Copley and Brods were victorious in a closely fought match. The Woodhead boys have been in indifferent form since Christmas but recent performances against promotion challenging Middlesborough and champions York have been encouraging. It could be the first of three games in eight days for Rishworthians, who also have a Yorkshire Shield quarter against Hullensians at Pontefract on Tuesday. This will also double as their last league game of the season. A win would likely see them hosting Middlesbrough in the semi-final at Copley on April 28. But first thoughts turn to the game at Hipperholme with their target being to finish above Brods in the table. The Woodhead men lie one place ahead of them by just one point. Rishworthians go into the game in confident mood after a good win over Bradford Salem last week. “We played some excellent attacking rugby, although we did go to sleep for about 20 minutes and let them come back at us,” said team manager Dan Ingham. “It will be a tough ask against Brods even though they have not fared as well lately. “We’re looking forward to the challenge and hope to use the slope well,” said Ingham. While teenagers Ben Sutcliffe and Will Bowers are not available, Chris Flanagan is back. Young Thomas Jowle retains his place at flanker after a fine performance last week. After tomorrow Rishworthians have the much delayed game against Hullensians. Matches between the sides have been called off three times this season because of the weather. Brods seconds have no game tomorrow but the Beavers will travel to Cleckheaton. On Sunday, the Brods Minis will be out at Woodhead in force when they entertain Moortown.